Perfect for street use, the Buddy Club N+ Spec Coilovers are a complete height and damper adjustable suspension kit which is cost effective and well rounded for budget minded weekend club racers. With optional urethane isolated aluminium upper mount design, engineered spring rates, 15 level damper adjustability and ride height adjustment capabilities, the Buddy Club N+ Spec Coilovers can accommodate any driver’s preferences. Vehicle ride height is adjusted independently of spring pre-load. With other alternatives available on the market today, vehicle ride height is adjusted by reducing or increasing the preload on the coil spring, this primitive method leads to inconsistent spring rates that are dependent upon the vehicle ride height. With the entire range of Buddy club suspension components, including the N+ SPEC, vehicle ride height is independent of spring pre-load. This method ensures that the spring rate is always consistent, no matter how high or low your car is. In addition, it ensures that the spring is always properly positioned onto the strut and effectively reduces miscellaneous and unnecessary noise. 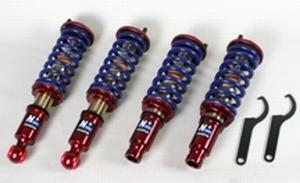 Suspension adjustability is a key element when selecting a top quality coil-over system. The N+ SPEC DAMPERS are designed to accommodate a wide range of driving conditions from regular roads to prepared racing surfaces. Dampening settings ranges from hard (+4kg/mm) to soft (-4kg/mm). Also available is the optional urethane isolated upper pillow-ball mount. The urethane isolating ring keeps suspension noise to a minimal while maintaining the precision feel of a solid mounted strut. The shock-body is constructed out of cadmium plated steel and is finished with beautifully anodised precision CNC machined aluminium ends. Urethane bushings are used when applicable to ensure a top quality product. In a complete suspension setup, the coil-spring is a very key element. The coil-springs used on all Buddy Club suspension setups are specially made to exacting specifications by Buddy Club engineers. Each coil spring is manufactured to exacting tolerances to ensure performance in every demanding situation. As you can see in our spring rates chart below, our designs are more aggressive and focussed on performance than many of the super soft street coilovers available on the market. To ensure that the N+ SPEC Dampers stay looking superb through your years and years of ownership, each precision CNC machined aluminium component is beautifully burgundy anodized and each steel component is cadmium plated for corrosion resistance. Great attention to detail was taken to ensure that you will be completely satisfied with your ownership of Buddy club components.